I didn't know what this was but it is all about text stamping in layers. I basically got out lots of different stamp sets and just starting stamping away. It was fun to do and I like all the different mix of fonts. I went for my much loved one layer using the linen embossing plate to add texture. Sequins, enamel dots and gems to finish off. At Inkspirational this week we are happy to welcome back one of our original team members Kylie. 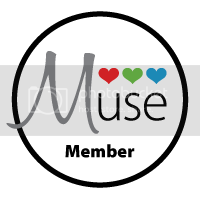 Kylie was part of the DT right from the beginning of Inkspirational and I am so pleased she has re-joined us.I am sure most of you know Kylie but if not check out her blog here. You will love what you see. Kylie is also the designer and owner of her own stamp company Happy Little Stampers. I have used quite a few of their sentiments in my card today! 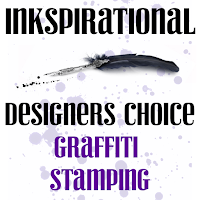 Time for you to get those sentiments out and have a go at Grafffiti stamping. Great how you used the sentiments! And so sunny with those colours! Enjoy the weekend! 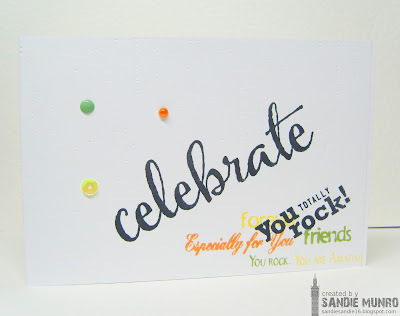 Oh, love the fun stamping and the lovely colours, Sandie!!!! Such a cute card completed perfectly with the three dots and sequin!!!!! A lovely OL with a wonderful CAS look!!! Oh I love this technique! Going to have to give this a go. Your card turned out awesome Sandie! You're my inspiration!Tis is great and I've noticed you using these citrus colours lately and they look wonderfully fresh. This contemporary design is so cool and it suits your CAS style. Super card! Beautiful graffiti card....love those fabulous colors. Late to commenting, as I'm at my mom's visiting as well as marking the Spring sitting of diploma exams...and navigating my way through the snow! Yeesh! Enough with that already! Your graffiti stamped card is absolutely fabulous, Sandie. and your take remains true to your always delightful CAS style! I'm feeling a bit of an 'oops' with my card, as the definitions and images I found for graffiti stamping were a bit more...shall we say, 'messy'. Oh well...variety, right? *grin* Love this!